Today has been one of the most wretched days of my life. I’ve had the worst migraine that I’ve ever had, and it has been a doosy. I started my day with a strong dose of cayenne and ginger (as usual) , followed by a small cup of medicinal tea. I was grossly nauseous, and so went back to bed. I tried to read some of my Bette Davis/Joan Crawford dual biography, but was too sick. The pain was mostly in the back of my head, exactly where my cyst is, and it was swelling- massive pressure was building up and as usual, it felt as if I’d been shot in the back of the head- but this is actually worse. When a person is shot in the head, more times than not, they die. If they don’t die, they’re rushed to the hospital and given large doses of morphine, stadol, demerol, or something of that nature so they’re not suffering. In my case, I have to sit it out. Minutes feel like hours. Words are too simple to describe this kind of ongoing pain. “No, I don’t want to throw up in front of everybody,” I said. Two minutes later I ran to the bathroom and “worshipped the porcelain god” as the saying goes. Now if you’ve never thrown up a fairly large amount of cayenne pepper, you haven’t really lived yet. My whole head was on fire! My nasal passages felt as if somebody’d sprayed acid into them and I was crying tears that actually burned. (Not boo-hoo crying, but phsyiologically.) Also, the pain was exacerbated by the fact that I had a new surge of fiery adrenaline coursing through my body, particularly in my head. It is now 12:45 a.m. and the pain is still pretty intense (it’s moved around to my front right eye socket). Ibuprofin is a joke, but I took two anyway. It’s been three weeks since I’ve stopped taking my Lortab and Ambien. My liver was beginning to tell me that I couldn’t keep taking pills and remain “healthy”. Granted, I never exceeded 10 mg. at one time, which is the equivalent of 1 blue Lortab, (but seldom took even that much). This is part of the reason why I decided to become certified in Substance Abuse- I know far too many people who have been reduced to a mere statistic, having lost everything (including themselves) to drugs. I’ve become passionate in my search for a homeopathic solution: pain management without having to take pharmaceutical chemicals. Poppy seed tea can be taken at small doses to combat severe pain, such as the pain from my arachnoid cyst, while still allowing me to function. Naturally, if you take a larger amount, you can get higher than a kite, but if I wanted to get high, I’d just smoke a joint. I like to be in control of my faculties though. This is part of the reason why I quit drinking liquor over five years ago. If I chose to not take anything at all, I’d be limited to “getting out of bed to pee” and that’s about it. I can’t live that way. So after much consideration and trial and error, I’m sticking with my cayenne, ginger, and med. tea, when necessary. I do get more migraines this way (not taking pharmaceutical drugs) and some days it’s sheer agony, like today, but my liver feels 80% better. When I compare my pain, to the pain that Jesus had to endure, I shudder to think that I could even complain. I still have two eyes that see, and a heart that loves- two working hands, a family that I love and that loves me. I have much to be thankful for. 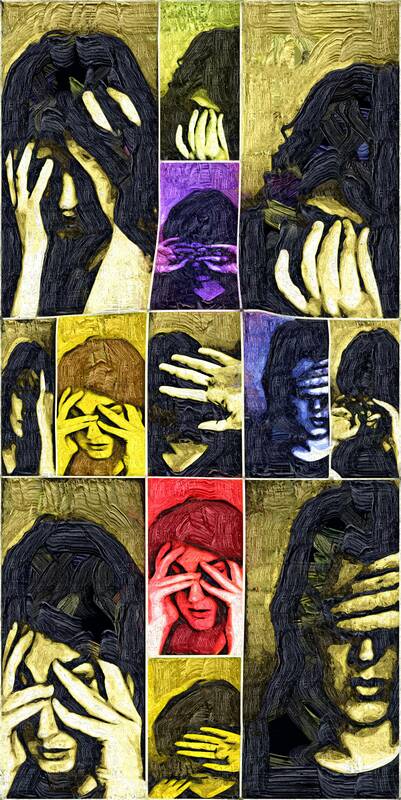 I decided to convert my collage (Pain in Rainbows) over into a digitally rendered fauvist styled painting on stone. I rather liked the way it came out. While I wasn’t planning on sharing my arachnoid cyst situation with all of Australia, I wanted to include my Aussie friends (all of whom are artists: sculptors, writers, and painters) as we’ve all been close for about six years now. I feel pretty fortunate to have such a great group of friends. Many have solo exhibitions and are quite successful in the art world. And, a finer bunch of people I’ve never known. The site I’m referring to is Redbubble. I’ve been there six years. Hmm…maybe seven. I really don’t like pop art. Never cared for the Marylin coloured collage or the tomato soup cans (though I admit that I was thoroughly infatuated with the life of Warhol and have much respect for his talent). 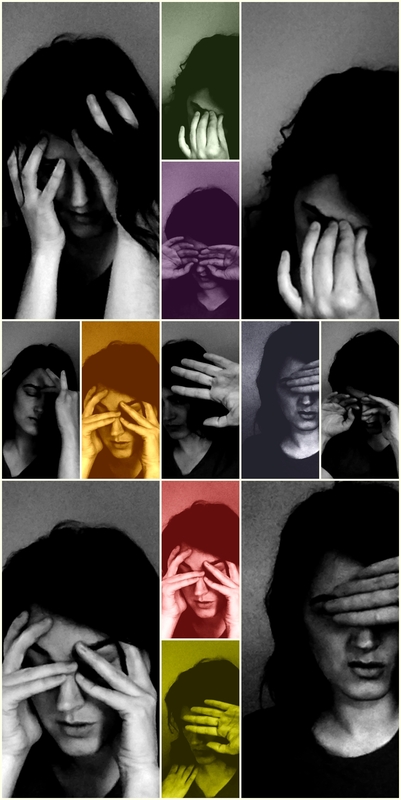 I decided to mingle the style of pop art with my love of B&W to examine and interpret my migraine pain. I suppose it could convey most any pain. After all, we all live with pain- whether emotional or physical- but none escape it. Like art, music, laughter, joy, and death- pain is a language that needs no interpreter. I have recently found my Canon G3 battery charger. The camera is absolutely obslete on todays market, but I know that camera better than my own skin. I cut my teeth on that camera (manual exposure, shooting in monochrome, manipulating the lighting and shadows, and so on). I think the problems many artists and photographers face today are due to the fact that the modern digital cameras are so “capable” that the user need only click one main button, “auto”, and the camera “does it all”. While it can mimic the accuracy to a degree, it cannot automatically shape and mold the light on a level that one can attain if he or she manually adjusts the settings. It’s like comparing a bologna sandwhich to foie gras. Or, Vienna Sausages to caviar. If a person doesn’t know how to shoot in manual, he or she may still be able to create an effective image, especially in Lightroom, GIMP (which is what I use), or Photoshop, but then it falls into digital artistry and not so much “photography”. If you are curious to know what kind of a photographer you are, throw your DSLR (or P&S) in MANUAL, as well as MONOCHROME, and go out during the golden hour as well as high noon- then look at the stills. When you can take a batch of photos that aren’t blown out, hot- and bleeding here or there- you’re ready to move on to a more advanced camera. There’s really no point in getting a fancy camera if you don’t know how to shoot in all manual! I can’t say this enough. And the truth is, about 80% of all of us photogs that have high end cameras are LAZY. (Notice I said “us”.) Very few actually shoot in manual mode, much less understand how to. If I had a big rig, I’d be the laziest photog in the world. Thank God for innovation and ghetto-rigging.